- Handle Material: Premium Wood. - Applications: Gesso, Paint, Modeling Paste & Texture Gels, Aggregates, Plaster, etc. - Uses: For Mixing, Spreading, Scrumbling, Spreading, Scratching, Large Paintings, Murals, Theater work, etc. 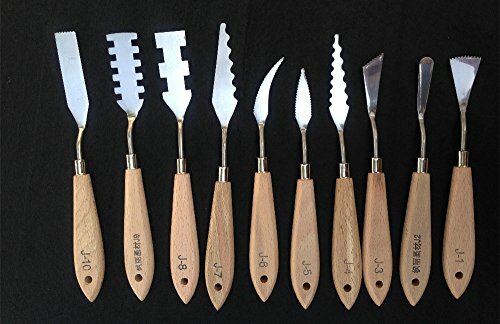 Special Effects Texture Spatula Paint Knives for oil painting, Acrylic Mixing,etc. Wooden handle,weight light and comfortable. 10 different shapes and styles for Multiple demand. Great idea for working with oil paints on canvas or palette. View More In Palette Knives. If you have any questions about this product by Togood, contact us by completing and submitting the form below. If you are looking for a specif part number, please include it with your message.